The contents of the site may be changed by J.K.ARMY LTD. in the future without prior notice. It is you, as a user, to occasionally return to our site and receive the latest updates on the terms and condition. Any amendments of terms and conditions will be taken into effect immediately. Your usage of J.K.ARMY LTD. following any changes will constitute the agreement to such amendments. It is possible for the contents of the site to have typographical errors, inaccuracies data or omissions for the item descriptions, pricing, and availability. We reserve the right to correct any errors, inaccuracies or omissions and to change or update information at any time without prior notice. We apologize for any inconvenience caused. If you are not completely satisfied with your purchase please feel free to contact us for more detail. Due to the quick turnovers of certain items, J.K.ARMY LTD. reserves the right at any time to amend the number of certain products that you have purchased. If that is the case, we will contact you directly and provide you with different options available at that time. We will try our best to fulfill your order request. However, in all circumstances, J.K.ARMY LTD. reserves the final decision to refuse any order. J.K.ARMY LTD. reserves the right to change or modify any of the terms and conditions contained in this User Agreement, or any policy of the Site, at any time without prior notice. Any changes or modifications to this User Agreement or policy will take immediate effect upon posting of the revisions. Please review this User Agreement and any other applicable policies periodically in order to understand the terms and conditions that apply. - Promo Codes can only be redeemed online. - You must be 18 years or older to redeem a promo code. - Only one (1) promo code may be redeemed per user account. - Promo codes are redeemable on select merchandise only. Airsoft Guns, Discounted Items and Special Items are ineligible for your specific promo code. - Promo codes may require a minimum dollar value purchase. - Some promo codes are not valid on product(s) in pre-order status at the time of order or on wait list reservations. - Promo codes cannot be used in combination with other discounts, coupons, promotions, shipping specials or other promo codes. - Even if a code is accepted at check out, all orders are reviewed by the Customer Support team prior to fulfilment. If orders are deemed in violation of any of these Terms and Conditions, they will be adjusted accordingly. - Promo codes must be reentered at check out in order to be applied to your order. Promo codes can not be applied after order is submitted. Promo codes are strictly free promotional voucher codes with no monetary value. Expiration dates are always displayed day/month/year. Code may expire on the specified expiration date, at any time (GMT+8) – regardless of the physical time zone/location of the code holder. (GMT+8) We strongly suggest using your code PRIOR to the expiration date. - Any promo code amounts in excess of your purchase will be carried over until your purchases exceed the balance on the card or the expiration date is reached. - Promo codes are not replaceable if lost, stolen or damaged. - Promo codes cannot be combined with other jkarmy.com discounts, coupons and promotions. - Promo codes have no cash value and may not be redeemed for cash. 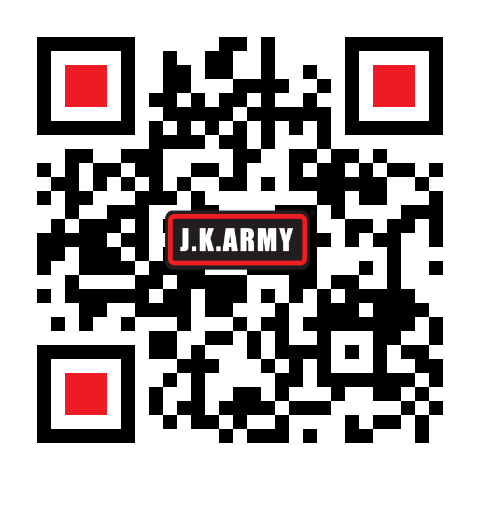 J.K.ARMY’s promotional promo codes are free and have no cash value, therefore can have an expiration date. - You are responsible for the security of your own promo code number. We will not replace any amount from your promo code that has been used by another party regardless of how the promo code number was obtained. - Promo code value applies only to the product price and does not apply to shipping, sales/VAT taxes or fees. J.K.ARMY LTD. reserves the right, without further notice to the holders of the promo codes, to modify the terms and conditions for use of the promo codes, or to suspend or cancel the promo code program in whole or in part. - Import of airsoft guns are prohibited in some countries, such as Australia, Mainland China, Singapore, Netherlands and Denmark. However, we can ship combat gears and accessories to these countries. If your country is not shown above, please contact for more information about our shipping service. - J.K.ARMY offers shipping orders to customers partial if they desire, but they must request this action and agree to the partial shipping policy. If you wish to have your order shipped partial please make note of it on your order, in stock items will ship ASAP, and out of stock items will be placed on a second order, this order will be placed with the information from your first order, and you will receive an email notification with all the information for that order. Agreement to partial shipment of orders implies that you accept the fact that you will pay shipping charges each time we send you a box, and it implies that you agree to let the J.K.ARMY staff place a second order using your information. - All Airsoft guns can't be shipped to APO/FPO addresses. - To cancel a pending order please fill in the contact form here. - At J.K.ARMY we aspire to provide exceptional service and support to our customers. We understand that not every purchase made from our website will be a flawless fit for every customer. Therefore, if you are not satisfy with a product that you purchased at our online store, you will have 5 days from the date of receipt of order to request a return for refund or exchange with no restock fee (exclusions apply, see below). - All merchandise being returned MUST be in Brand New condition. Meaning item has no signs of use or attempted use, modifications or signs of attempted modification (for example: removal or modification of internal and external parts), and items are returned with all included accessories, merchandise tags, factory stickers and logos still attached, and factory packaging is fully in tact. - Any merchandise that is reported and/or determined to not be in this condition will not be granted return authorisation. - Before shipping back any items for return, you must first receive return authorisation. A return request can be initiated by sending us an email through contact form. - Customers will receive an email from the RMA Department authorising you to return items. An RMA number will be provided along with return instructions that need to be carefully followed. - Please DO NOT send any returns back without an RMA number from J.K.ARMY. Any packages received without return authorisation or an RMA number will be refused and disposed. In brand new and unused condition with no signs of attempted use or modification; but retail packaging is received in unsatisfactory condition that would not make the item restock. Meaning manufacturer sealed packagings have been disabled or removed and/or packaging has signs of damage such as warping, water damage, is ripped, torn, has holes, or has shipping labels attached directly onto retail packaging. Have signs of use or attempted use, modification or signs of attempted modification (i.e. removal of orange tip flash hider, installation of internal and external parts), accessory items included in packaging have been used. - No returns on any Gift items, Mystery Boxes, Wholesale or Discounted purchases. - J.K.ARMY maintains full rights in determining condition of merchandise. - Open box fees will be automatically applied upon receipt and inspection of items by the RMA Department. - J.K.ARMY reserves the right to refuse and/or deny any return for refund or exchange for any item that is determined to be used, damaged, altered, modified, or is in any condition that would deem the item to be not restock-able or resell-able. This return policy is only applicable to "BRAND NEW" and “UN-USED” items. If you are encountering any problems or issues (defects, failure, damage) with an item you received, it will be covered under our warranty policy. All merchandise, unless otherwise stated, that are sold on our website or any of our retail stores will be covered under a 5-day warranty. Please refer to the warranty policy for more details. We know it is very frustrating when you encounter an issues with a product that you have just received. It is our goal to ensure that we take care of any issues as expeditiously and efficiently as possible. If you are experiencing problems with a product that you purchased from J.K.ARMY, you may contact our Customer Service Department via online store live chat during our regular business hours (9:30am - 5:30 pm GMT+8, Monday - Friday) to help troubleshoot your issues. Please provide as much information possible for the Customer Service Representative to help. Many cases are easily resolved over the live chat with basic troubleshooting assistance by our staff. - Please DO NOT send any returns back without prior authorisation from the RMA Department and the proper documentation. - All warranty claims must be returned through our RMA process. - All merchandise purchased from J.K.ARMY which will be covered under the J.K.ARMY warranty policy for 5 days. - At our discretion, J.K.ARMY reserves the right to determine which cases are fit to be authorised for warranty processing. - The warranty only covers manufacturer "defects", not user error. - Any false information is used to obtain RMA authorisation will result a denial upon inspection once the product is received. In general J.K.ARMY will be able to settle most warranty claims in house. However, some manufacturer warranty claims will be handled by themselves. You will be notified at the time of RMA processing if your particular product will fall under this case. We will be able to assist you in any ways we can on your warranty claim. Products marked with MAP Policy have a strict minimum advertised price set by the manufacturer, no additional discount is allowed. Coupons cannot be used for Products marked with MAP.